July 10th was the groundbreaking ceremony on Forbes Street, London for two more families! We were “Blessed by the Rain” stated Mr.Cooper during the groundbreaking ceremony for the two new builds Carter Work Project Build and the Canadian Heroes for Humanity. We will be participating in a Team Build for the Canadian Heroes for Humanity build in November and are excited to be able to help provide a home for this wonderful and kind family. More information is to come on 1st Choice Home Solutions Build Day! 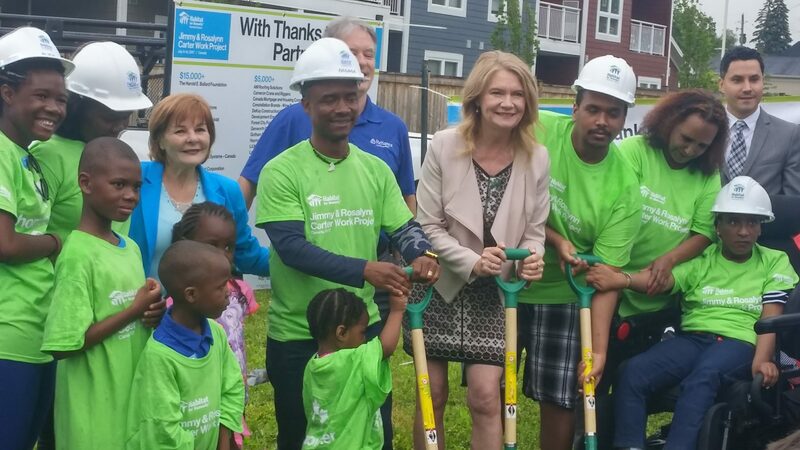 For Canada’s 150th, organizations across Canada are working to provide 150 new homes, including Awatash Kassa’s Family. Originally from Ethiopia, Awatash has worked very hard to raise her children and put down roots in Canada. The Awatash’s and Coopers will be neighbours as their homes are being constructed side by side, as a part of 17 new affordable houses being built by Habitat for Humanity Heartland Ontario. It is being built on the former site of the Manor Park public school. We are happy to once again provide a new GAF roof for both of these well deserving families.